Kitchen Exhaust and Hood Cleaning forms. Pressure Hood Cleaning Service & Work Orders, Job Estimates, Cleaning and Service Proposals, Service Agreements, Contracts, Cleaning Warranty Certificates, Invoices, Kitchen Exhaust Cleaning, Preventive Cleaning Maintenance Agreement, Maintenance Agreement, Comprehensive Cleaning & Maintenance Agreement, Job Invoice, Job Service Invoice, Cleaning Service Yearly Maintenance Agreement, Job Proposal, Cleaning Contract, and more. 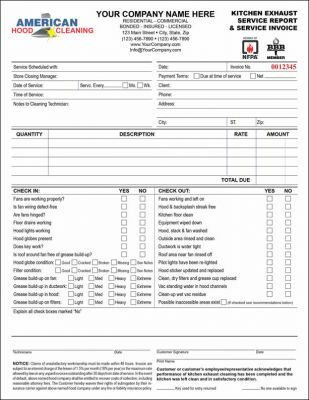 All purpose kitchen exhaust invoice form with technician's check-in and check-out inspection report, it also contains general, industry standard terms and conditions and customer's signature line. 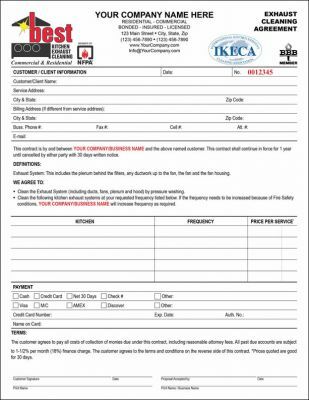 All purpose kitchen exhaust and hood cleaning proposal and also serves as a maintenance and service agreement. 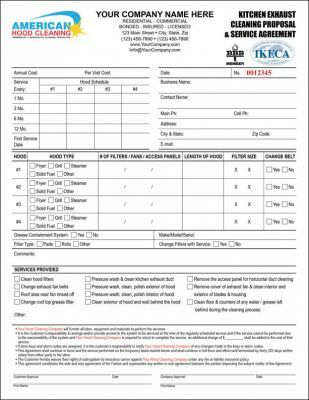 Form has fields to enter customer name and contact info, fields to enter annual cost and per service visit, hoods to clean, number of filters, fans, access panels, length of hood, filter sizes and if belts changed -if any. It also provides checkboxes of services provide with addition space for "other" services. 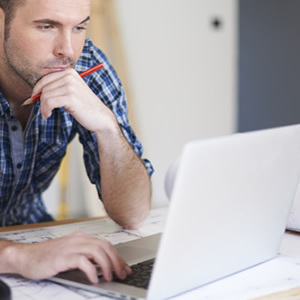 Standard industry terms and conditions at bottom of form with signature lines for both, customer and company/technician approval.